Ladies and gentlemen - we won! Premier Mike Rann announced the full protection of the Arkaroola Wilderness Sanctuary yesterday morning, having flown to the sanctuary to deliver the good news. There is wide praise for a decision to prevent mining in the remote Arkaroola wilderness region of outback South Australia. Premier Mike Rann and ministers have flown to the region to announce the SA Government will change the Mining Act as an interim measure, then introduce specific legislation to ban any mining in the area. Mr Rann says an application also will be made to put Arkaroola on the National Heritage list, with a longer-term aim of gaining World Heritage listing. "We have decided to give the region unprecedented protection," Mr Rann said. 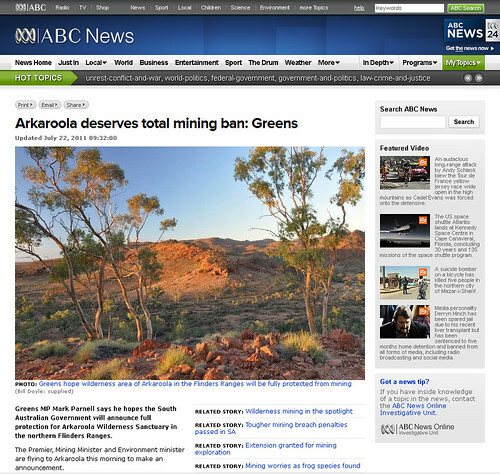 The Greens have lobbied for a mining ban in the Arkaroola region and the Liberal Opposition opposed the removal of any environmental protection. "We could have settled for what the Greens wanted, which was simply a ban on mining, but I wasn't satisfied that that would provide enough protection from all forms of incompatible development," Mr Rann said. 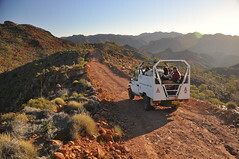 Earlier this year, Marathon Resources was allowed a new mining exploration licence for Arkaroola Wilderness Sanctuary. 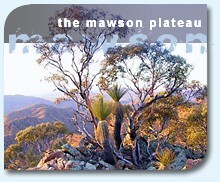 The company had faced a ban after it was caught illegally dumping exploration waste in the northern Flinders Ranges in 2008. To get the new licence it agreed to a conditions imposed by the South Australian Government for it to keep exploring the outback region for uranium and other minerals. SA Mineral Resources Development Minister Tom Koutsantonis said the Government had made clear the area could not be mined. "Earlier this year we renewed a one-year exploration licence for Marathon Resources with strict conditions to allow exploration within Arkaroola, as we were legally obliged to do," he said. "We acknowledge that the mining industry needs certainty which is why at the time we made it very clear that the exploration licence in no way confers a right to mine. 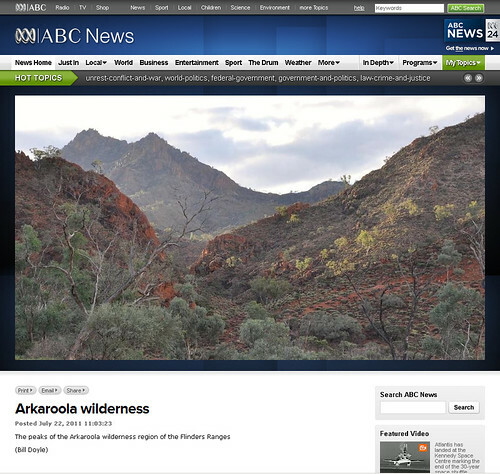 "The Arkaroola wilderness area is a unique environment and as such we are giving it special, one-off, legislative protection." Marathon Resources shares are in a trading halt. Marg Sprigg from the Wilderness Sanctuary is thrilled by the news that there will not be mining. "It's wonderful. After 40 years or so of my family being here we've achieved what we really hoped to," she said. SA Greens MP Mark Parnell says the Government's decision acknowledges the region's significance. 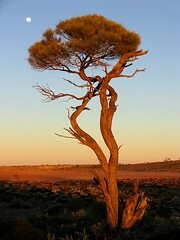 "Supporters of Arkaroola come from all sides of the political spectrum. Today the government has announced that it has listened to the people of SA," he said. 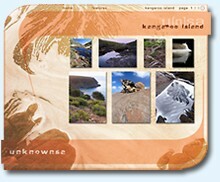 Mr Parnell tweeted: "Not surprisingly, the Premier has a dig at the Greens, but most important, no digging in Arkaroola!" Adnyamathanha representative Enice Marsh said it was a dream come true for Indigenous people to know the area would be protected. "I just want to thank the people that persevered with this and kept coming to our meetings so that we could document all this," she said. 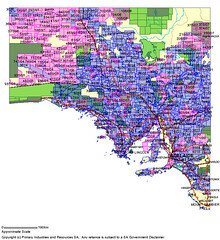 Former South Australian senator Nick Minchin was involved in the campaign to protect the area from mining development and is pleased with the decision taken. "This is not a place for mining, it is far too precious to mine," he said. "I'm a supporter of uranium mining, I'm a supporter of mining generally and this state has a lot of potential for mining but there are some places you simply cannot mine that should be out of bounds for all time." Opposition Leader Isobel Redmond welcomed the Government's decision, but said it should have been made two years earlier. The Advertiser's take this morning is here. There's also an opportunity to comment, and a poll regarding whether it was the right decision. Congratulations to Mike Rann and his team for making this historic announcement. 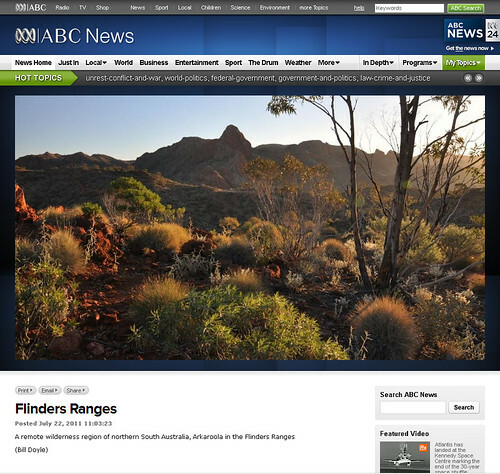 This is a great day for the Flinders Ranges, and a great day for all South Australians who care about their wild environment - a truly unique and irreplaceable resource. Further, it's a great day for all Australians and all those people across the world who know true value when they see it. And it's a great day for you; if you wrote to, e-mailed, phoned, petitioned, pamphletted, stuck the sticker on your car, spread the word - it's your victory, too! Congratulations! A group celebration will be organised shortly - we'll keep you posted! 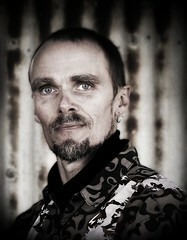 PS A little over 4 years and more than 90 blog posts later, I can't tell you how pleased I am! 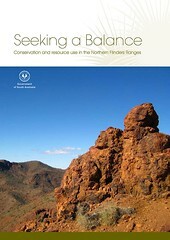 Reading this in the library in Cobar. I assumed Rann had gone to Arkaroola, to announce another compromise with the mining party. But this is good news. Can't quite believe it. 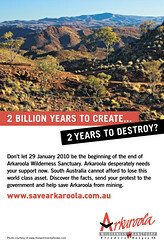 The banning of mining near Arkaroola and Vulkathunha sacred areas is only a token move designed to appease the eco-friendly public while SA State Government, a servant of the World Mining Industry, continues to be complicit in MASSIVE mining elsewhere in South AUstralia, to include the most pitiful mine of all : the damn Olympic Dam proposed open pit largest deadly uranium mine on the planet, and perhaps the main resource for the coming race war and advent of Nature's full fury in response to human heavy metal deviationism. while letting business become fully involved in RECYCLING REMEDIATION and RESTORATION of Nature's place. "To Mine is No Mind"
Thanks for keeping the blog going, Bill. A lot of people are each a little bit responsible for ensuring this decision was made, and you are one of them! Congratulations Bill - to you and everyone who supported the cause. Not many wins come the way of campaigners. There are all sorts of 'but, but, but' moments one can, and does, have - but let's just for now thank Bill, the Spriggs, the Greens, yes I suppose even Nick Minchin(! ), and everyone else involved for making this happen. The caveats and the bigger picture will properly re-emerge later on. 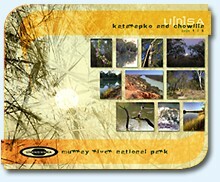 Four years, 90 blog posts and countless stunning photos of the amazing Arkaroola - you are a champion! I certainly wouldn't have followed the roller coaster of Arkaroola's fate or have been prompted into any action without your indomitable efforts. Hope you can just go out bush with a light heart from now on! thanks for your contribution - bill - i'm genuinely sorry about having to switch on the 'moderation' process but comment spammers have really been cluttering up this journal! 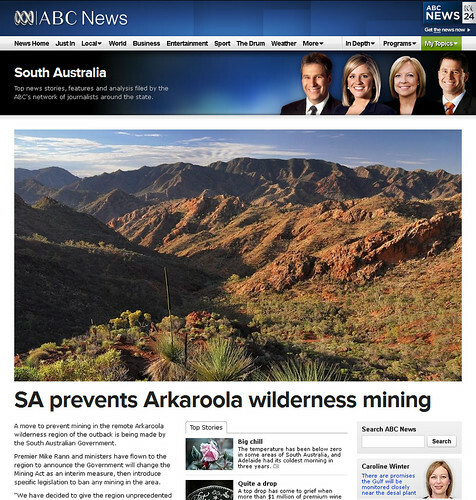 the save arkaroola website has been launched - click the links to visit it! see SA the miners way! you can either subscribe to receive feeds via the link below each post in the main panel, or simply send me an e-mail to join the list! 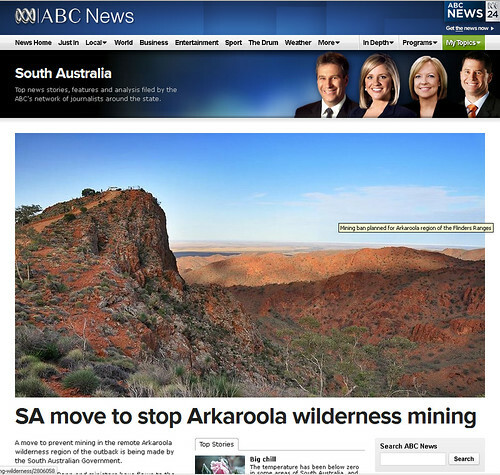 "We don’t want a mine – of any description – on Arkaroola"